Written in Fire by Marcus Sakey, a Mysterious Review. 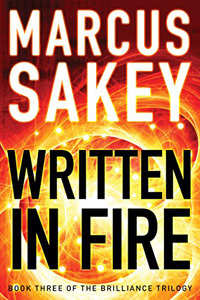 Review: Nick Cooper is on a mission to kill the man that he holds responsible for the rift in the United States, the polarization of the 1% of the population who were born as brilliants and the rest of the country, in Written in Fire, the third and final entry in the Brilliance Trilogy by Marcus Sakey. Nick is a special agent with the Department of Analysis and Response. A brilliant — or abnorm, as is the more general term — himself, his job is in part to keep the fragile peace between his own kind and everyone else. But with the federal government threatening to electronically tag all the abnorms and otherwise marginalize them in society, his assignment has ever more complicated … and dangerous. And now, after a sect of abnorms based in Wyoming have killed thousands of soldiers, bombed the White House, and otherwise ground normal business the a halt, Nick sees as the only path to a safer and more secure future is to get rid of man that he believes is dictating the actions of the abnorms, the elusive John Smith. Written in Fire is by far the weakest of the three books in this trilogy, in part because there is really no story here. The first book, Brilliance, set up the premise of the brilliants and their abilities, created an alternate contemporary United States in which they live and prosper, and, to be sure, are persecuted, and delivered an exciting, interesting, action-filled story. The second, A Better World, continued with a credible story within this universe but ultimately was a typical middle book in a trilogy, one without a solid beginning or ending. Here, not only is a story completely lacking — the quest to find and kill John Smith is not nearly enough to justify nearly 400 pages of text — but the characters seem to have lost all sense of humanity. An armed militia marching on the brilliants' holdfast in Wyoming uses children as human shields. Innocent brilliants are lynched and hung up in public spaces by otherwise law-abiding citizens. Psychological torture is officially sanctioned. Even Nick, the so-called hero of the story, has taken on a kill-or-be-killed attitude, acting as judge, jury, and executioner for whomever he deems not aligned with his own personal cause. Maybe the average American was driven to this point by brilliants just trying to save their own kind, but are they no better than those they seek to destroy? There is no happy ending here, nor should or could there be, but there is a good line that should resonate with all politicians and voters today and in the future: "[Nick] was the one who'd called for compromise, and the nature of compromise was that no one was happy. That's how you knew a fair deal had been reached." Though officially the end of this trilogy the whereabouts of a key character introduced late in the book is unknown at the end, with an epilogue leaving the door wide open for more to come. Acknowledgment: Thomas & Mercer provided an eARC of Written in Fire for this review.